Dyson hand dryers are the finest part of visiting an airport restroom—which, to be fair, is not a difficult contest to win. Just dunk your hands into “Airblade,” a gift from the dystopian future, and without you touching a single surface, it’ll whip every droplet of water off your hands. 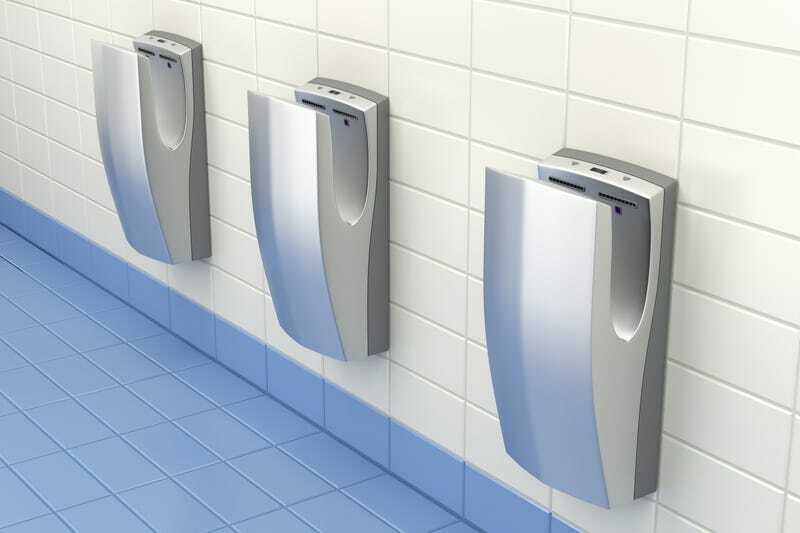 But because no pleasure comes guilt-free, a study in the Journal of Applied Microbiology reveals that these jet dryers also launch lots of viruses into the air, over great distances, and for great periods of time. Dang. We already knew that air dryers sent bacteria into the air, but the new study confirms that viruses join the party too—concerning because viruses are better equipped to stay infectious while floating through the air and chilling out on bathroom surfaces. Dyson’s jet dryers spread 20 times as many viruses as an old-fashioned warm air dryer and 190 times as many as a paper towel. If you wanted a quick takeaway, you might say its a tradeoff between the lives of trees and the health of humans. But it doesn’t have to be! Hypothetically even these jet-powered virus launchers would be harmless if people washed their hands properly in the sink, eliminating the viruses from the get-go. (Dyson has been quick to point this out in response to similar studies.) But if a lifetime of observation is any guide, we’re all savages who settle for slapdash 5-second rinses or nothing at all. Being a little less lazy will help children stay healthy and slow the scourge of antibiotic resistance. It’s difficult to cleanly assign blame in this situation. Should we point to the dryer manufacturer, which seems to operate on the assumption that everyone washes their hands perfectly? Is this a naive assumption that ignores the grimy reality of the everyman, leading him to unwittingly spread his viruses willy-nilly? Or do we blame the everyman’s incompetence in carrying out one of the most basic aspects of daily hygiene? I’m no corporate stan for Dyson, but my scorn lies mostly with my fellow man.